Why should we reduce salt, what is salt anyway and why does it increase blood pressure? Salt is a compound of two elements, sodium and chloride, that comes from the sea or can be found in rocks. Although this article emphasizes the need to reduce salt, it is important to stress that our bodies need a certain amount of salt to function properly. Along with other elements, our cells need salt to maintain the correct fluid balance. It also helps our muscles contract and helps nerves send impulses through our body. In extreme circumstances it also helps prevent hypothermia. In fact, some recent research is actually saying that reducing salt may actually be harmful and age-well.org will be investigating this issue and reporting our findings on this site. However, in most Western cultures we consume far too much salt for our health. For example, the salt intake of the average American consumer is somewhere between 4,000 and 5,000 mgs per day which is around double the amount recommended for a healthy diet. The current sodium recommendation made by the Federal Government's National High Blood Pressure Education Program (NHBPEP) is 2400 mg (~1 tsp of salt). However, a recent study carried out in connection with the DASH Diet showed even better blood pressure results with an intake of only 1500 mg daily. Where does all this Salt Come From? Dash stands for Dietary Approaches to Hypertension but, as we will explain, hpertension or high blood pressure can lead to life-threatening conditions by damaging your blood vessels and arteries. But where does all this salt come from? 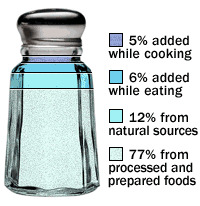 The graphic on the right shows that much of this salt (77%) is coming from processed or commercially prepared foods, 12% from natural sources, 5% is added when cooking and a further 6% is added at the time of eating. Too much salt is one of the main causes of hypertension and can lead to a variety of other conditions and diseases, including oedema, kidney stones, heart attack and stroke. Hypertension is a silent disease and you may not feel any symptoms until serious damage has been caused to your heart. 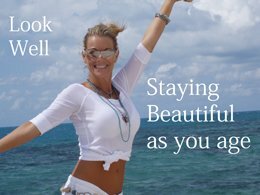 Therefore any efforts to reduce salt intake are a long-term investment for your general wellbeing, especially as you age. Salt can also cause bloating, which is a problem for many middle-aged women. Although this condition is not dangerous, it can cause a lot of discomfort. read the section on blood pressure. In order to reach recommended levels, it is necessary to reduce salt in your diet. The first thing you should do is cut out all processed foods or, if this is not possible, make sure that you read all labels before buying, to make sure any processed food you consume is low in sodium. The second most important thing you can do is to reduce the amount of salt you use while you are cooking. You can replace the salt with a variety of herbs and spices instead, in order to make your food tasty, or cut out salt altogether when cooking and stick to no-sodium seasoning. If you are into oriental food, you might tend to use soy sauce instead of salt. However soy sauce is itself extremely high in sodium, so you should avoid too much of it or go for one of the low sodium varieties. Use fresh products when cooking as fresh meat and vegetables have more flavour than frozen or canned, and therefore need less salt. In order to reduce salt, canned fish and vegetables should always be rinsed before use, in order to eliminate as much as possible. Adding salt to your meals when eating is another area that is under your control, even when you are invited out. Never use salt without first tasting your meal, and gradually add less and less so your palate becomes used to the natural taste of the food you eat. Fast foods and salty snacks are lethal if you are trying to reduce your salt intake and should be avoided like the plague. Go for healthy fast food options - such as salads and wraps, and replace salty snacks with salt-free nuts and dried fruit or, better still with crunchy, freshly cut vegetables. Eat more fresh fruit if you need a pick-me-up between meals. And don't forget to drink plenty. Green tea, fresh fruit juice without added sugar and plain water are among the best options. Drinking at least eight glasses of water a day will wash any excess from your system. The DASH diet , combined with a decrease in salt will help you to cut down on water retention and, combined with an exercise programme, can help you lose weight and prevent many age-related illnesses, in addition to lowering your blood pressure. In general, a diet that emphasizes fruits & vegetables, whole grains and low-fat dairy appears effective in bringing down your blood pressure reading. Losing weight, cutting down on sodium, boosting potassium intake and limiting alcohol are all proven ways to help control blood pressure and avoid a lot of other age-related diseases. For further information about hypertension including some excellent video presentations giving an overview of this silent disease for the layman and explaining in simple terms what the condition can do to your body, please go to High Blood Pressure (Cont/d).